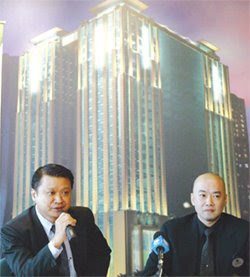 SMART DEAL: 3com Malaysia country manager Marcus Lai (left) and Ng at the media conference. GOLDIS Bhd plans to build more integrated buildings in Southeast Asia and China as it seeks to boost income. These will be similar to its GTower building in Kuala Lumpur, a 30-storey building that has offices, a hotel and a club. Goldis is already looking at a few locations in Singapore, Bangkok, Jakarta and Shanghai. It is identifying strategic partners in each country to build four GTowers over the next 10 years, said Colin Ng, head of corporate investments. "We are being opportunistic as the cycle for the property market is heading downwards. GTower integrates a hotel, office and club which will work well in urban areas," he said. Ng was speaking to Business Times in Kuala Lumpur yesterday after Goldis' wholly-owned unit, GTower Sdn Bhd (GTSB) inked a deal with 3Com Corp for the deployment of 3Com intelligent building systems to power GTower's information communications technology (ICT) connectivity. GTower is a 30-storey building at Jalan Tun Razak, Kuala Lumpur, encompassing a 180-room five-star boutique hotel, 112 CEO duplex office suites ranging in size from 2,500 sq ft to 7,200 sq ft and a club. It is due to operate from April next year and will be retained for rental income. GTower has attracted oil and gas majors, financial and IT firms, embassies and multinational companies as tenants. GTSB is negotiating for a few contracts and hopes to sign a few long-term lease agreements soon. GTower is Goldis' first Grade A++ project, which will be accorded MSC status by the end of this year, Ng said. Grade A++ features two additional components than a Grade A property. It confers the property with green building status and means it is ICT ready with MSC specifications. The building is the first carbon positive building in Malaysia, as it cuts carbon emissions. GTSB is investing RM470 million in GTower and it hopes to recoup the investment in 10 years. KUALA LUMPUR: The Selangor state government will allow the development of Canal City to go ahead, despite the need to review some of the details regarding its effectiveness as a flood mitigation project with the developers, said Selangor Menteri Besar Tan Sri Khalid Ibrahim. According to Khalid, the review is needed as the state government felt that canals were not the most viable solution to alleviate floods in the southern part of Selangor. He felt that the construction of retention ponds would be more appropriate. “The canals may be able to prevent floods in the city itself, but ultimately could overflow rivers and cause flooding in other parts of the states. Our view is that the property development and flood mitigation work must go hand in hand to ensure the success of the project,” Khalid said after the dialogue session with Japanese investors here yesterday. The RM10 billion-project essentially was mandated to Kumpulan Europlus Bhd (KEuro), a company where IJM Corp has an associate stake. Separately, IJM Corp and KEuro has estsblished a joint-venture company to undertake the RM10 billion Canal City project which is essentially a property development over 1,983 hectares (4,900 acres) in Kuala Selangor. In return for getting the land from the state, the joint venture is to undertake a flood mitigation project for Selangor. So far, the joint venture has invested some RM130 million in the construction of ponds and canals, resettlement expenses for the Orang Asli in the area and land acquisitions. On foreign investments in Selangor, Khalid said the state has received RM5.88 billion in foreign direct investment (FDI) up to June this year, compared to RM4.8 billion in 2007. Discussions are under way with Q-Cells of Germany for a RM5 billion solar cells manufacturing plant, and the state is expected to announce another major investment from a UK-based company later this year. Of the 1,447 Japanese companies currently operating in Malaysia, 617 or 42% of them are based or have operations in Selangor, a testament to the state’s popularity with the Japanese business community, said Khalid. Khalid assured the Japanese investors that their concerns and needs would be given attention by the state government, and short- and medium-term measures are being planned to overcome the many challenges such as rising crime, traffic congestion and restriction of foreign labour. Khalid also lamented the fact that almost 60% of the gas produced by Petronas Bhd in Kertih, Terengganu, was being sold to independents power producers (IPPs) while only 10% was for industrial use. “Pressure has to be exerted on Petronas by all parties concerned to ensure there are no empty gas pipelines in industrial areas,” he said. The state is facing shortages of industrial land at this moment, as established industrial areas such as Shah Alam are almost filled up. Selangor Science Park 2, part of Klang Valley 2, the new growth area in Selangor comprising Sepang and Kuala Langat districts, is now being developed to be the new high-tech industrial centre.